The striking personality of Vlasta Štěpová (64), the minister of trade and the travel industry (as it was known post-1989), was typical of the political scene in the period of social and economic transformation. In 1999 she was appointed to the prestigious position of vice-chairman of the Parliamentary Assembly of the Council of Europe, and she is currently the ambassador to the same organization in Strasbourg. 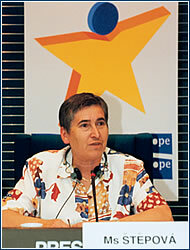 In 1996 she became a Social Democrat member of the Parliament of the Czech Republic (PČR), but more importantly she was elected member and chairperson of PČR’s permanent delegation to the Parliamentary Assembly of the Council of Europe. After 1999, as the vice-chair of the assembly, she presided over sessions of the 800 members of the national parliaments that represent over 800 million European citizens. Since December 2002, Štěpová has led the Czech Republic’s permanent mission to the Council of Europe. Her agenda isn’t that different from that of other Czech ambassadors, the only distinction lying in the scope of her duties – the Council of Europe is a pan-European organization that brings together 44 countries. So, as she points out, she has lots of work: “I haven’t been in Prague with my husband, who has accompanied me in life for forty years, since December, and we miss our children and grandchildren,” Štěpová confides, while adding that she’s glad to be able to humbly serve the country of her birth.